Many pundits out there throw out the words overbought and oversold when it comes to stocks or the major stock indices. Is there a way to keep track of overbought and oversold? There are many technical indicators (special indicators by looking at the stock charts) to help determine oversold and overbought conditions. Oscillators are the most popular. At one point, a stock (or index) is overbought, and then at another point, it oscillates back to oversold. One popular Oscillator is the S&P (Standard and Poors) Oscillator, which is a proprietary Oscillator. In Jim Cramer’s ‘Real Money: Sane Investing in an Insane World’ , Jim Cramer mentions the proprietary S&P Oscillator as one way to spot a market bottom. He says that it costs around $1000 to subscribe. When it’s over five, if he were fully invested, Cramer said he would cut to being 75% invested. At this time, short-term traders should maybe go 50% invested, and “if you’re a guy who is able to short, maybe 25% short,” he said. “That’s how much I have faith in this indicator. I have faith in almost no indicators other than this one. For more inexpensive ways to determine oversold/overbought, one can use the RSI indicator. RSI stands for Relative Strength Index. When the RSI is over 70, the stock or index is overbought. When the RSI is under 30, the stock or index is oversold. In the above example with Garmin (Chart of GRMN with RSI information here), we notice that when RSI is in overbought territory, GRMN is near its high, and when RSI is in oversold territory, GRMN is near its low. Towards the middle of 2007, we do notice that GRMN remains in overbought territory, but GRMN makes very good gains during this time. 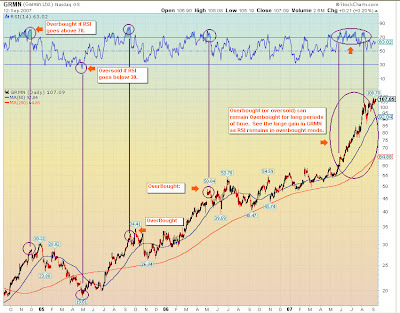 This is an example of an overbought situation remaining overbought for long periods of time. The same can happen with oversold stocks or indices. Some technicians suggest waiting till the RSI goes down below 70 after remaining overbought, or wait for RSI to go up above 30 after remaining oversold. There are many other oscillators as well such as using Bollinger Bands, or Stochastics. TradingDay has a good link to some of these oscillator methods. You would like to look at several of the different indicators and look at the support and resistance levels of a particular stock or index. The original article appears on The Tech Farm blog and is available here. We use the tool oscillator for the investment analysis that can help our clients a lot through which they may know the best investment strategies. Visit epicresearch.co to be updated.